VitawinAyurveda, understand skin related issues and are dedicated to creating some of the bestskincareproducts for you and your skin. We realise that your skin is one of the most delicate organs in your body, and that it should be treated just as preciously. 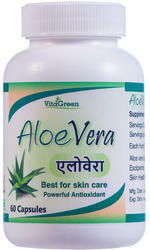 Aloe vera has been known for its healing properties for at least 6,000 years. In the early days, the plant was known for being a “plant of immortality” and was presented to Egyptian pharaohs as a funeral gift. Over time, groups from many geographical areas have used aloe vera, including Indians, Chinese, Mexicans, and North Americans, too. Humans have long known about the plant's healing benefits, and over the years have used aloe — which is also known as “burn plant,” “lily of the desert,” and “elephant’s gall” — to help treat wounds, hair loss, hemorrhoids, and digestive issues. These days, aloe has an entire industry behind it. Its juices are used in cosmetics and personal-care products such as moisturizers, soap, shaving cream, and suntan lotion. The aloe vera product that probably comes to mind most easily is the bright green gel that’s stocked on drugstore shelves. You’ve probably used it to soothe a nasty sunburn. Aloe vera is also available in supplement form, which is said to offer the same possible benefits to the skin and digestive system as other versions of the plant.